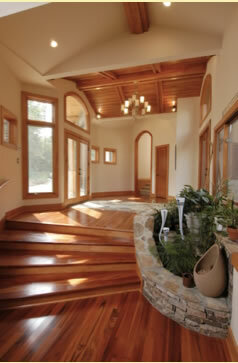 The front entry gently curves outward, with a stone finish that mimics the stone entry floor. The foyer has a vaulted ceiling, and glass doors and windows to the rear courtyard. To the right, stairs lead down to the living areas. The kitchen is open to the dining room and family room, and has a stone finish wall with an arched opening for the six–burner stove. A fireplace is centrally located between the dining and family room, and doors from the dining area lead to an outdoor deck. 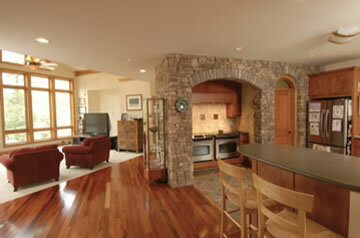 The family room ceiling vaults to a 15'-8" peak, and glass picture windows reach the ceiling. Next to the family room are a half–bath, an office/library, and a stairwell to the lower level. On the other side of the foyer, stairs go up to a hallway that leads to all of the bedrooms. The master bedroom is to the right, and wraps around the entire back of the house for maximum views. It features a vaulted ceiling, a walk–in closet, and a private bath with both a shower and a tub. 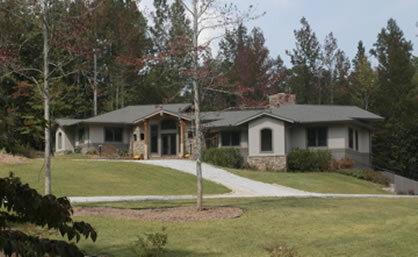 On this wing, there is also a laundry room, and two more bedrooms, each with their own private full bath. 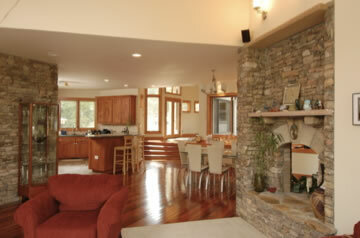 If you choose to build the lower level, there is an open recreation room with a fireplace and views to the backyard. There are also an office, a full bath, and a mechanical room. A covered walkway connects the house to a detached 3–car garage. These plans were drawn using a well–known and highly respected architectural design software program called ArchiCAD. This software can export the same files in .dwg format, so they can also be modified by anyone who uses AutoCAD, which is nearly universal. The CD for this plan includes the files in both ArchiCAD and AutoCAD–ready .dwg, as well as in .pdf for easy viewing on your home or office computer. This unique, split–level home provides a dramatic gallery entryway, and a clear separation of living and sleeping areas. The U–shaped plan creates a partially enclosed courtyard, which is surrounded by glass for viewing from inside the house. The home was originally designed for a sloped lot, so it's designed to gently cascade down a hill.